When the Silversea cruise ship, Silver Spirit, called on Honolulu, Hawaii, during our Grand Pacific Voyage, Alan joined the Silver Shore Collection excursion, Heart of the Missouri. Along with 9 fellow cruise guests, he toured the Mighty Mo for a fascinating 90-minute exploration of the massive battleship. Today, he shares his story with us. I’m standing on Broadway. No, not that Broadway. 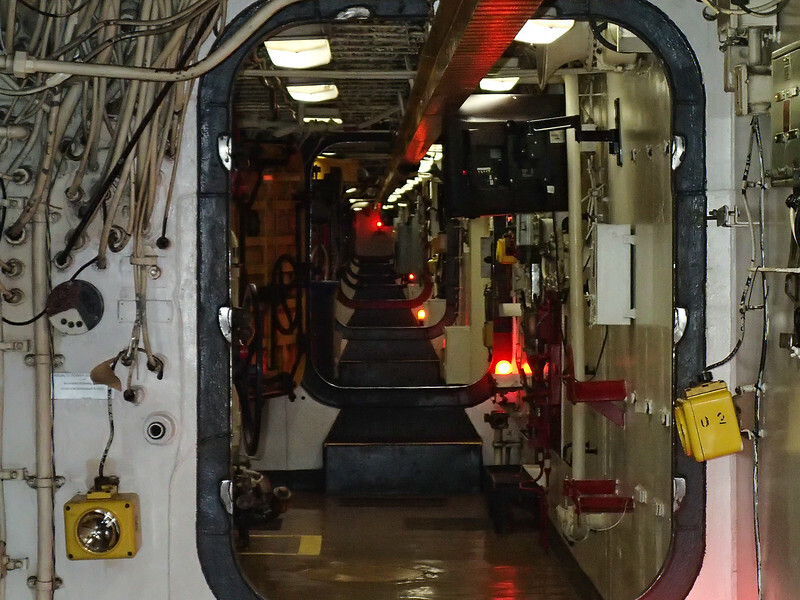 This Broadway, as it was known to crewmembers, is the longest straight passage inside the battleship, USS Missouri. 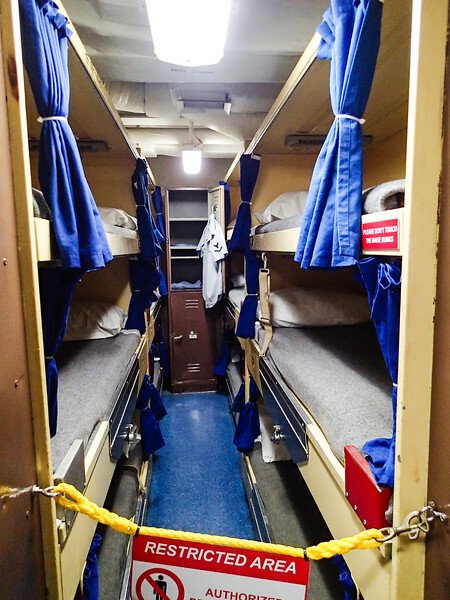 Used by thousands of sailors over the years, it’s the fastest way to navigate from sleeping quarters to the mess or battle stations. The Mighty Mo, as the Missouri is known, was built in the early 1940’s and first became operational in June 1944. It is famous to this day as the site of the surrender of Japan, which ended WWII in the Pacific. WWII in the Pacific ended on this very spot. The USS Missouri sits on Battleship Row in Pearl Harbor. A short distance across the water, the USS Arizona Memorial pays tribute to the sailors still entombed inside the battleship’s sunken hull from the attack on Pearl Harbor, December 7, 1941. The Mighty Mo is massive—nearly three football fields in length, over a hundred feet wide and over two hundred feet above the water. Home to 2700 sailors during WWII, it was a floating city complete with a hospital and post office. The first thing I notice, besides the ship’s shear size, are the nine 16” guns. 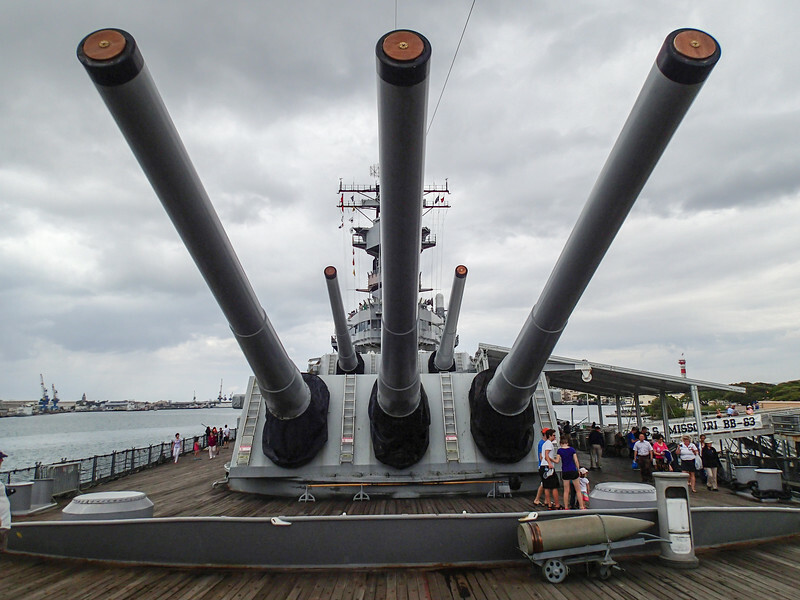 Housed inside three huge turrets, the guns are the core of the ship’s firepower. As I stand underneath one of the guns, it makes me think of a rifle multiplied by a thousand. Exactly how do 16” guns work? An elevator moves the 2,700-pound projectiles and gunpowder bags from lower decks to the turrets. With every crewman doing a specific job at a specific time, the guns can be loaded and fired every 30 seconds to a target 23 miles away. All of this is done from a moving platform with the ship in pitch and roll and influenced by wind currents, humidity and many other variables. Yet, they still achieve the required accuracy. Descending into the interior of the ship from the main deck, I turn left and right a couple of times and feel completely lost. The endless short passages and water tight doors with “knee-knockers” and “head-bangers” make fast travel dangerous. Every room, every space is purpose built. To me, the engineering that is needed to make this ship a working, coherent war machine is remarkable. Primary systems are backed up by secondary systems. And secondary systems have their own backup systems. Every contingency has been planned for. In a boiler room, I notice a small periscope. Our guide tells me that it allowed the crew members to monitor the smoke coming out of the stacks. Black smoke could reveal the ship’s location to the enemy. And those 16” guns that I mentioned? They sit on three massive gun turrets designed to slide off the main deck into the water if a 45 degree list is reached, thereby increasing the chances the ship can right itself. All these systems worked without the benefit of computers that we all take for granted today. In the 1940’s, there were no wireless computer stations monitoring the entire ship, no laptops sitting on every desk. Yet the systems worked and did their job well. 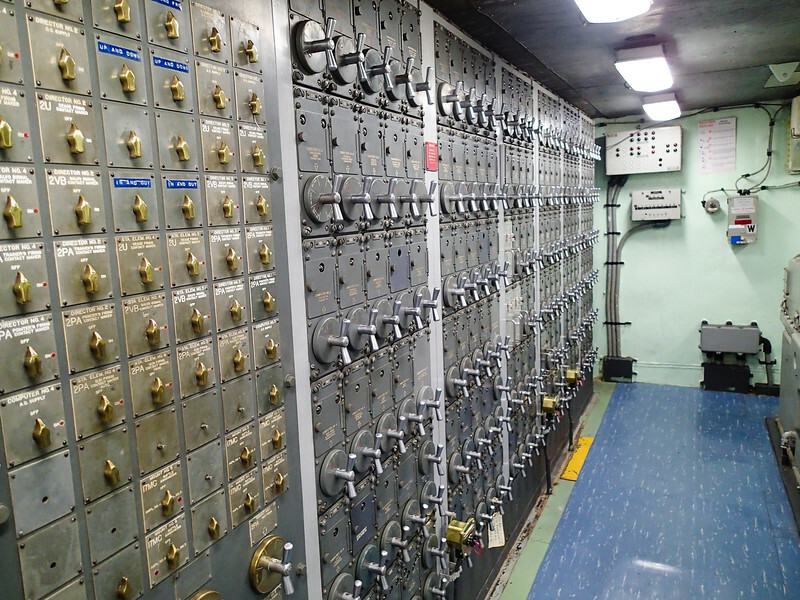 As I walk in the passages, exploring the fire control room, mess, sleeping quarters and chief engineers room, I visualize the sailors of yesterday, putting myself into their space. I feel their presence, so many sailors here before me, working, relaxing and serving their country. If I tilt my head just right I hear their chatter—the endless talk about missing home, missing wives and girlfriends, their laughter and of course their complaints about the officers. For a few moments I feel connected to these men. After all, if I had been born earlier I might have been serving on this very ship. The beginning and ending of WWII in the Pacific in one photo. After an hour below deck, our tour group emerges back into the Hawaiian sunshine for a last look around. There, embedded in the wood deck, a circular plaque signifies the spot where the Japanese surrendered, ending WWII in the Pacific. Standing at the spot where a major piece of history was made, I look beyond the bow of the Mighty Mo to the USS Arizona Memorial and the war comes full circle. The war started just over there and I’m at the very place where it ended. Planning a cruise that stops in Hawaii? Check out our Cruise Excursions in Hawaii page for things to do. 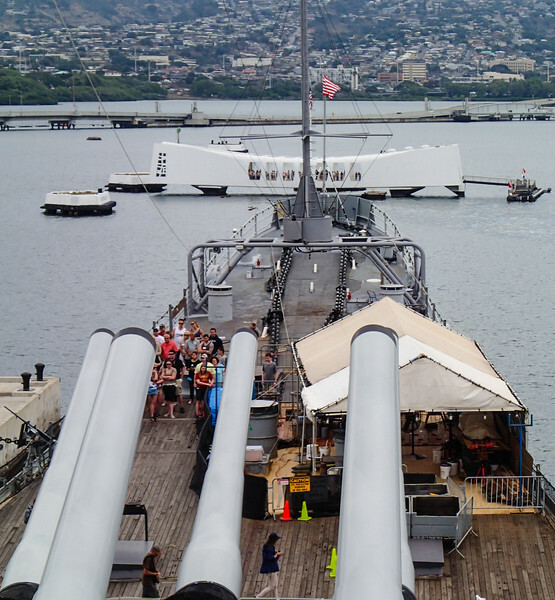 On your next visit to Honolulu, I highly recommend that you tour the USS Missouri to experience this significant piece of history for yourself. 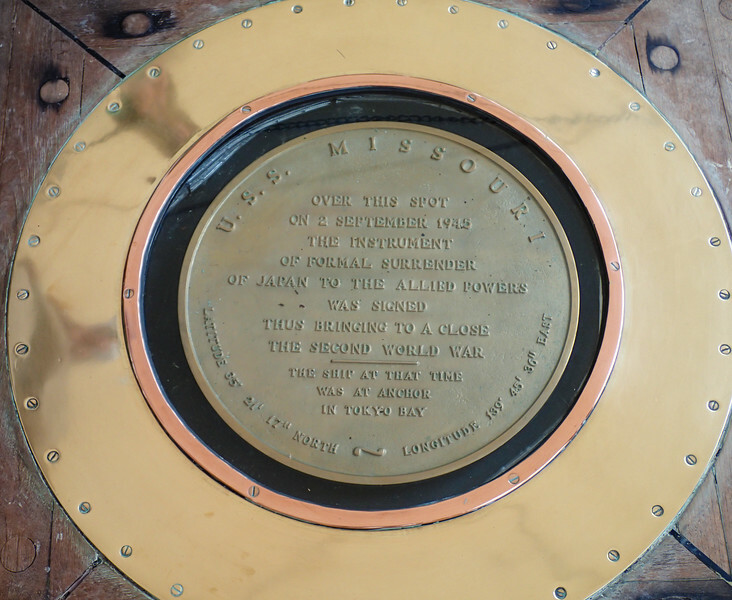 Have you toured the USS Missouri? Join the conversation at the My Itchy Travel Feet page on Facebook or send us an email to ask a question or share your experience. Alan Hull is photographer and trip planner at My Itchy Travel Feet and a big fan of road trips. When Donna sees Alan sitting at the kitchen table reading road maps, she packs her bags.